Packing. The very thought of it takes the edge off the excitement of going on holiday, at least till we’re on our way. It shouldn’t be such a difficult task. As we spend most holidays in our camper van, we don’t have to bother with suitcases. We pack our possessions straight into the van’s streamlined cupboards, and here they stay, out of sight, until we need them. Well, that’s the theory, anyway. Years ago, when we were child-free, holidays meant sailing in Greece. Packing in those days meant shoehorning toy-sized toiletries and capsule wardrobes into a collapsible sausage-shaped bag, ready for decanting into ship’s lockers on arrival. A camera, notebook and pen (plus daily access to yesterday’s English newspaper for my husband) were our only desert-island luxuries. Leaving behind the clutter of everyday life at home and at work was exhilarating. Forget feng shui – there were barely any material items to arrange. Then in time, we had a baby to pack too. Until babies are about three, there’s an inverse relationship between the size of the child and the volume of luggage it requires. Just as Laura’s own baggage was starting to reduce – no more bottles, bibs or buggies – she hit toddlerhood, when she didn’t want to be confined to a boat. She needed playparks full of children to become her new friends. Any nationality, language no object, provided the children were her size. And so slickly we transferred, like Chitty Chitty Bang Bang, onto land. We traded in our boat for a camper van. Drier, less lurching, and less likely to strand us due to weather conditions, it was a welcome and natural evolution from amphibian to reptile. And while I was in charge of packing, it was still soothingly minimalist too. But now that Laura packs her own bags for holidays, new challenges have arisen. Numerous cuddly toys and dolls anthropomorphise into inseparable friends who would simply pine away if left at home without her. By the end of last year’s summer holiday, Laura’s entourage took over the entire vehicle. So for our half-term trip to the Highlands, I decide to set a new rule: one bag of toys per person. A serious constraint for Gadget Man, but a less daunting challenge for me: most of my toys are books to read or write in. It is easy to smuggle extra rations onto the van’s built-in bookshelf. I expect a rebellion before our departure. But no, Laura sits demurely on her booster seat with an old black barrel handbag of mine bulging at her side. On her lap is a single cuddly toy: Heather the Best-Dressed Rabbit. 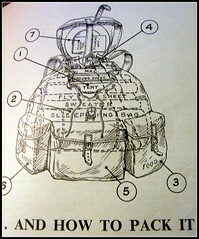 (Heather even has her own gas-mask case for this term’s World War II topic). I’ve suggested that instead of taking lots of toys Laura pack a bag of Heather’s clothes to ring the changes along the way. I am pleasantly startled to see she’s taken my advice. Pointing the van north, we hit the road. The half-grown crops in the Cotswold fields undulate as we pass, as if waving goodbye. They will seem so soft and green on our return from serious Scottish mountains. Four hours later, when we stop for the night at Morecambe Bay, the true contents of the little black bag are revealed. With a coy, self-satisfied smile, Laura unzips it and begins to pull out an endless stream of toys. It’s like watching a conjuror do the handkerchief trick. Three rag dolls, four horses, two dogs, a bird…. all these and more are soon strewn around the camper van, leaving my husband and I scrabbling, as ever, for a space big enough to sit in. One bag of toys it is, so I cannot complain. But what an astonishing mastery of the art of packing for one so young. I sigh and sit down next to Heather. When the summer holidays come round, I think I’ll put Laura in charge of loading the van.